While it's pretty much impossible to ever get bored of guacamole, I had a little fun, and changed up the usual guac by adding grapefruit instead of lime juice. 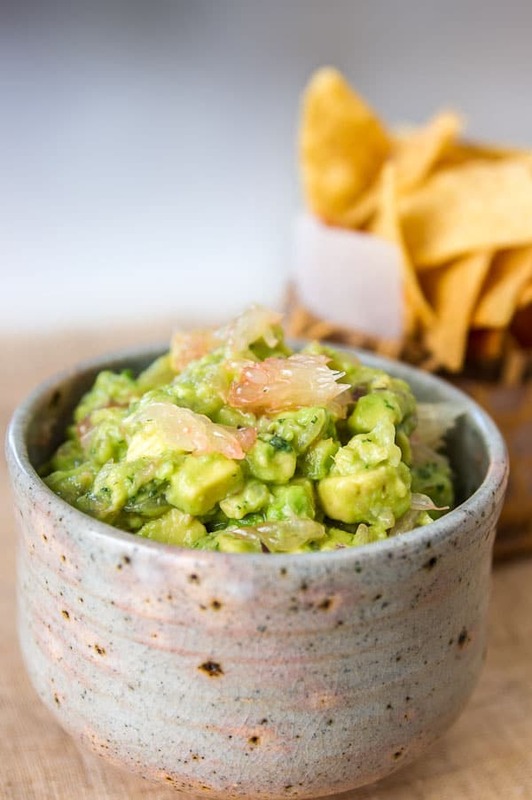 The grapefruit gives this guacamole a delicious citrusy punch, and it's the perfect conversation starter for your next party or potluck. Most store-bought guacamoles are preservative laden travesties made with more sour cream than avocado. That’s because avocado’s aren’t cheap, and they tend to discolor and spoil rather quickly. Luckily, guacamole is probably one of the simplest things you could possibly make in your kitchen! I love a tart guacamole and usually opt to douse the avocados with a healthy squeeze of lime juice. This keeps the avocado nice and green and the citrusy tang is a nice juxtaposition to the creamy avocado. A few years back, I found myself with some avocados that were ready to eat, a bag of tortilla chips and zero limes. I was about to go ahead and make the guac with champagne vinegar, but as I was removing the avocados from the fruit bowl, I spotted a lonesome grapefruit. Sprinkle some salt on the onions and use a squeezing motion with your hand to coax out some liquid. Rinse them with cold water, then pass them through a sieve and use a paper towel to remove as much water as possible. Add the onions to a bowl. Roughly crumble the grapefruit segments removing any remaining membranes into the bowl. It's okay if some juice comes out of the grapefruit. Add the avocado, cilantro and salt, then stir to mash up the avocado a bit, but leave some chunks. Serve with tortilla chips. Cool idea. Grapefruit in guacamole sounds like a fascinating addition! Vesticles! *pandagiggles* I just don’t get commercial guacamole. It’s obvious that they’re filled with preservatives and other not-so-natural stuff. Would love to try your version, mine is always the same: avocado, lime juice, salt, cilantro. Whoa, what a completely unusual spin on guacamole. I’ve had salads with grapefruit and avocado on top, so this isn’t a total stretch, but I definitely never would have thought of it on my own! I’m loving all the creative uses of grapefruit that I keep seeing lately! Ick. I would never touch store bought guac again either. I read the label on one and it said that it contained 3% avocado. To be honest, it just tasted like maynnaise and I’m sure the green colour didn’t come from the 3% avocado that was in it. 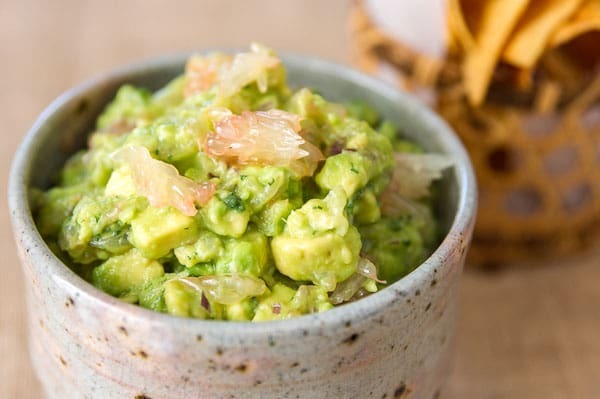 The combination of grapefruit and avo sounds fantastic, although I’m not sure if grapefruit and garlic would work since I love a garlicky guac. I”m trying to taste this as I read it, and I love this balance. Avocados need a little to a lot of acid and this is a nice surpirse. Munching on this now. So unlike my normal cumin/garlic/lime laden guacamole. Fun twist on the norm. Ingenius! Don’t know why this never occurred to me as grapefruit + avocado salads are quite common. Now if only there were a way to incorporate shrimp… shrimp + guac tacos perhaps? I like the sound of grapefruit in a guacamole! This sounds fantastic – will give this one a try. must have cilantro in guac! I love the addition of the citrus Marc. hope all is well! i couldn’t find grapefruit so i used grapes. not bad, not bad. How wonderful! One of my favorite salads from a cookbook published in 1968 containing family recipes from the 1950’s & 60’s featured an “Avacado and Grapefruit Salad with Basic French Dressing”. To a kid in Texas in the late 1970’s that was some kind of elegant and tasty salad! I had never seen such an exotic combo.- The dressing was vinegar, olive oil, salt, dry mustard and tabasco sauce. When we would mix the dressing it was a beautiful silky consistency- perfect to balance the ‘cado and citrus. Thank you for your updated guac! Thanks for sharing your story, it’s always fun hearing childhood experiences about food from someone else’s perspective. We used to get something similar to this at an authentic Mexican restaurant years ago. The owners were from Acapulco, and the guacamole was very chunky with pieces of grapefruit. I could not find an authentic recipe, so will have to try this one..